I have heard a lot about Tiny’s Giant Sandwich Shop probably 95% from Robyn. Last time when I was eating the banana pudding at Sugar Sweet Sunshine I noticed Tiny’s diagonally across and vowed to make a trip for a sandwich. Finally the Friday before the 4th of July I got off work early and decided to go to Tiny for a late lunch. I walked in and was quickly greeted by the waiter, he called my boss the whole time, and I sat down at the table nearest to the counter. I looked through the menu but wasn’t too sure what I wanted and ended up getting the tuna melt. I love tuna melt. I was pretty starving even before I got to Tiny’s but I’m glad I didn’t have to wait long for my tuna melt. 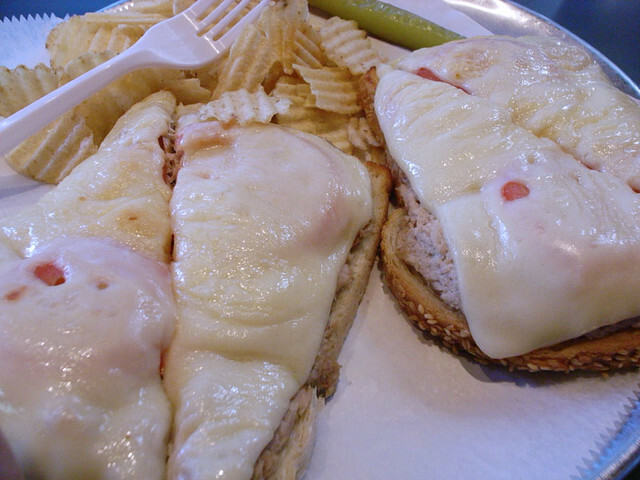 The open face sandwich with melty Swiss cheese looks good. Served with potato chips and a really thin slice of pickle, WTF? 2 slices of bread cut into halves so that means I have 4 tuna melts! The first 2 slices were awesome not too much cheese and a good amount of tuna. The cheese was still melty enough for me to pull to make that stringy cheese thing eh you know the thing that cheese does. Anyways, it really hit the spot. Next time I’m going to try one of their sandwiches.